Special Containment Procedures: SCP-1340 is to be kept in a plexiglass case in filing cabinet 83b at Site-128. SCP-1340 may be removed from its cabinet for any period of time, so long as it is signed out by an authorized user, and returned before nine o’clock PM. An authorized user may remove SCP-1340 from its case, but no physical contact may be made with SCP-1340 exceeding 38 minutes. Any user with a history of paraphilia should not make physical contact with SCP-1340 (not including paraphilia involving two consenting adults, and inanimate objects). SCP-1340 may not be exposed to light exceeding 32,000 lux, or temperatures exceeding 27 degrees Celsius. No paraphernalia depicting or replicating animals of the family Anatidae is to be allowed on the premises of Site-128, including but not limited to ornaments, sculptures, photographs, drawings, baubles, paintings, food stuffs, beverages, plumage, and/ or erotica. Should any individual show signs of indoctrination by SCP-1340, they are to be reported to their superiors immediately, and removed to off-site care facilities. 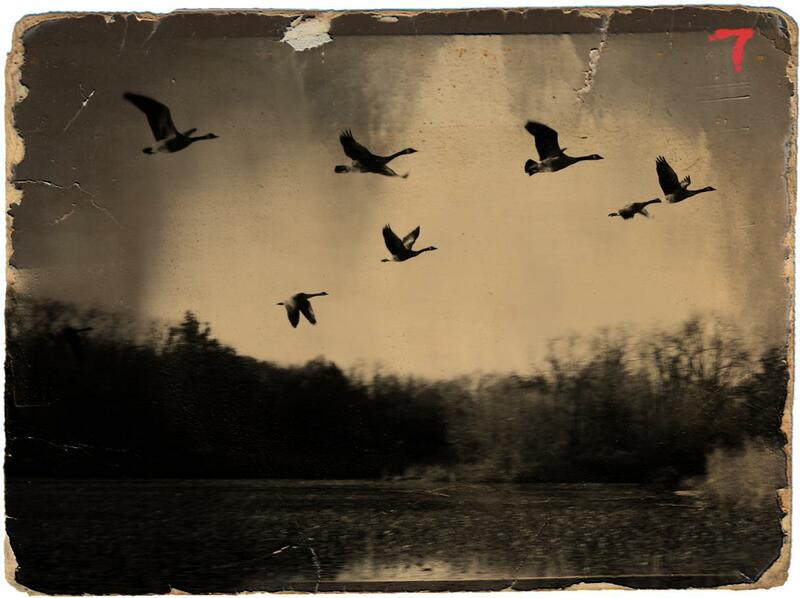 Description: SCP-1340 is a photograph of 8 ducks flying in a “V” formation over an unknown pond, possibly █████ Lake in California. The photographic medium seems to date back to the late 19th Century. At some point after its creation, an unknown individual added the number “7” to the photograph in red grease pencil. This addition seems to be relatively recent. SCP-1340 seems to instil an unnatural duck-related fondness in those who make prolonged contact with it. After 15 minutes, temporary duck related mania may set in, and experiments have shown permanent effects following 40 minutes of direct contact. The nature of this affection is highly variable. SCP-1340 was recovered by local police forces and held as evidence after the ritualistic murder of █████ ██████████ by her husband Robert ██████████. The victim was partly dismembered, and altered with various plastics and household objects. Reporting officers stated that she looked as if she were made to appear as an anthropomorphic duck. Following questioning, Robert stated in interview that he “Did her a service." Autopsy proved that she was dismembered alive, over the course of several days, before dying of infection. SCP-1340 first came to the attention of the Foundation when other enigmatic duck-related activities were observed in the records of the arresting officers. █████/1993: SCP-1340 removed from long-term storage for testing. █████/1993: Dr. M█████ establishes time frame for safe testing. 15 minute direct physical exposure found to have no lasting effects. █████/1993: Dr. M█████ requests ███ new subjects on which to test SCP-1340. █████/1993: Request denied. ██ new subjects sent instead, as well as ██ subjects declared fit for continued service after other on site testing. As containment protocols have been established, further testing is of minimal importance to the safety of on-site personnel, and such large scale requests will not be headed in the future. █████-█████/1993: Dr. M█████ studied effects on ██ subjects, including 5 volunteering agents, 8 members of the maintenance staff, 3 of Site-128’s Military attaché and ██ unnecessary personnel. Of ██ tested subjects exposed to 15 minutes of proximity to SCP-1340, 58% reported markedly increased affection for ducks; 34% reported an increased appetite for duck, and showed increases in salivation; 5% claimed to be unaffected; and 3% showed carnal lust after ducks, lasting several minutes, and followed by intense shame. █████/1994: Dr. M█████ removed from Site-128 for a period to last 25 days, citing research related stress. █████/1994: Dr. M█████ files for SCP-1340 to be returned to long-term storage, citing its potentially damaging effects on unaware minds. █████/1994: Dr. M█████ takes census of cubicles and offices in Site-128. Of ███ searched desks, over half (██%) had paraphernalia relating to ducks, including 472 photographs, 108 small sculptures, 57 large sculptures, 86 decorative ornaments, 34 instances of ducks carved into desks, 139 duck-meat sandwiches or other edibles, 987 duck feathers, one “Duck Gardens, CA” t-shirt, and no less than 2 taxidermy specimens. ██ individuals refused to give data. ████/1994: Dr. M█████ removed from SCP-1340 study team. Duck related items banned from facility. 2 facility personnel moved offsite for psych evaluation after violent refusal to surrender paraphernalia. ████/1996: SCP-1340 moved to long-term storage following Site Regulation 15-A-176, stating that any Safe class object not researched for more that 100 days must be returned to storage. ████/1996: SCP-1340 returned to Site-128, following a request for research from Dr. W██████. ████/1999: ██████ request SCP-1340 be removed to long-term storage, citing abnormal duck affinity resurfacing in Wing 3, and abnormally active requests for study of the object. ████/1999: SCP-1340 placed in a plexiglass case to prevent direct contact for prolonged periods. ████/1999: SCP-1340 moved to cabinet 83b, to remain in Wing 3 until such a time as it is declared fully understood.